"For more than three decades, there was substantial discussion and debate regarding domestic water supply to the town of Wakefield. In 1872, a group of concerned citizens petitioned the legislature to charter the Quannapowitt Water Company to give the provate company the right to take water from Quannapowitt and Crystal Lakes with the tributary waters which flow into them. The bill was hastened by the fact that the cities of Lynn and Boston had made preliminary examinations of the lakes for the purpose of adding them to their own water supplies. The town of Stoneham challenged the bill, and it was later amended to include the neighboring town. After several years of inactivity, Wakefield residents authorized a contract in 1882 with the company for 60 hydrants at $50 each per year, for a total of ten years. The same arrangement was made with Stoneham in 1883. In April 1883, a contract was signed with a Springfield company to build the water works and lay pipes in the two towns. Work progressed quickly, and the company began supplying water to the town from Crystal Lake on December 1, 1883. The works consisted of a pumping station with two large pumps capable of pumping three million gallons in 24 hours, a boiler house, pipe factory, coal shed, stable, superintendent's house and a large iron standpipe (with a capacity of 563,000 gallons) which was built on the highest point in Stoneham. In 1883, the company changed its name to Wakefield Water Company and on December 2, 1903, the town aquired the company and all its rights, pipes, hydrants, plant and equipment through an act of the legislature." -- Text from calendar by Jayne M. D'Onofrio. Photo courtesy of Cecilia Payro. 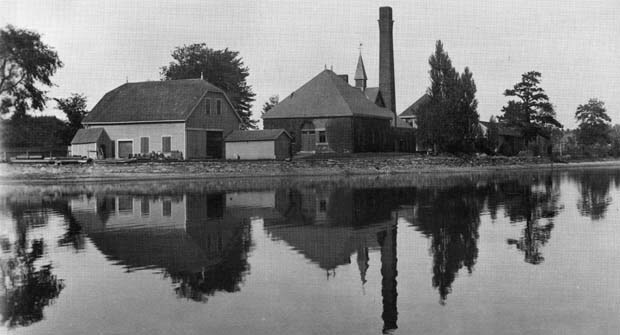 “Pumping station at Crystal Lake, 1905,” NOBLE Digital Heritage, accessed April 20, 2019, https://digitalheritage.noblenet.org/noble/items/show/7061.